Matt started his career with the Reading Youth set up and also played for their reserve team. 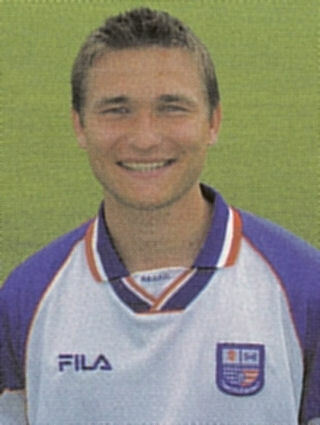 The defensive midfield player left Reading after failing to secure a place in the first team, and joined Slough Town in the summer of 1997. He was spotted by Bristol City manager John Ward, and signed for the Division One side in June 1998 for a £15,000 transfer fee although again, he failed to break into the first team. He went out on loan to Wycombe Wanderers in February 1999, and to Yeovil Town in September 1999 making seven appearances for the Glovers before being recalled and sent on loan to Diamonds on 25 November 1999 for a trial with a view to a permanent move. An 2½ year deal was ratified on 3 December 1999, for a reported £30,000 fee. His Diamonds career was very stop / start, and was not helped by his dismissal at Southport in April 2000, which proved to be his final league game for the club. Although he still had a year to run on his contract, he was not among Brian Talbot’s plans, and he was loaned out to several clubs. He was released by mutual consent in November 2001, and joined Hampton & Richmond Borough, before spells with Thame United in March 2002, and Henley Town the following season. He later emigrated to Italy to play for Vultur Rionero and then AS Trapani. He gained his UEFA ‘B’ coaching badge, and in the summer of 2006, became player / coach at Hellenic League side Milton United, although he is no longer with the club. No record of his involvement with the game has been found between 2007 and 2018.